PERFECT FOR THE AIRPORT AND MOTEL BAGGAGE HANDLER. 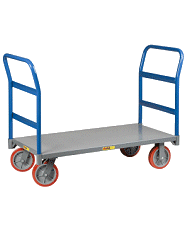 Loop handle with U-brace provides overall hand truck height of 52"
B&P's luggage handler hand trucks are designed specifically for motel and airport baggage handlers. They feature a carpeted back frame and folding nose.